Hung for two days in the garage and sitting in the bottom of my freezer for the last three years, I was wondering if the goose was still good. One of a snow and specklebelly pair that I had taken in the Sacramento Valley while trying out a new SP10 and 3-1/2” Remington 1187, it fell to the matched Federal Premium Blackcloud BB-sized pellets. When I was done with the aging process and had plucked them (the fresh hearts and livers had gone into a Ziploc, the day the geese were taken, for a later liver paté greatly enjoyed and long missed) I wrapped them in a three layers of cellophane. Surprisingly, three years later, not even a trace of freezer burn! 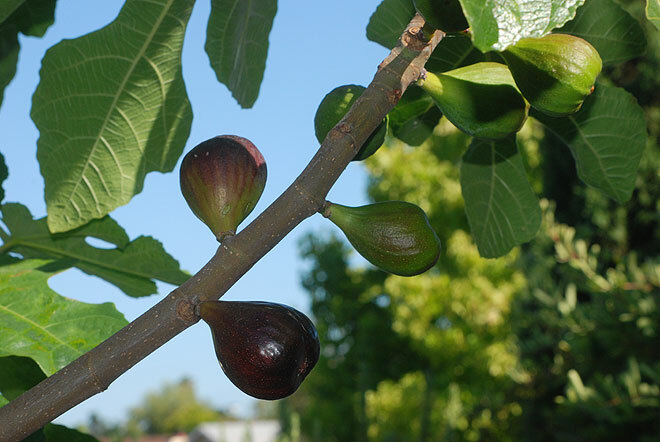 Originally, I was going to do a book review of Chef John D. Folse hunter’s cookbook bible, After the Hunt, but then something wonderful happened—the first round of figs turned a beautiful dark purple, signaling their ripeness! My huntin’ buddy Hank Shaw has written an number of articles on syrups, and one fig syrup recipe caught my eye. But, I enjoy eating my figs fresh and whole, so in order to stretch them, I decided to make the sauce for my goose more like a turkey’s cranberry sauce, thick and more like a jam. On the subject of the meat and “things not to do” once again surprised me by actually doing them. 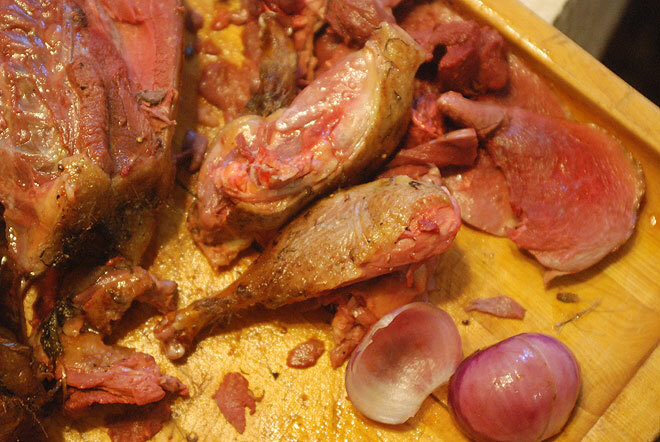 Always told that refreezing meats would make them somehow worse didn’t seem to be true with this goose. 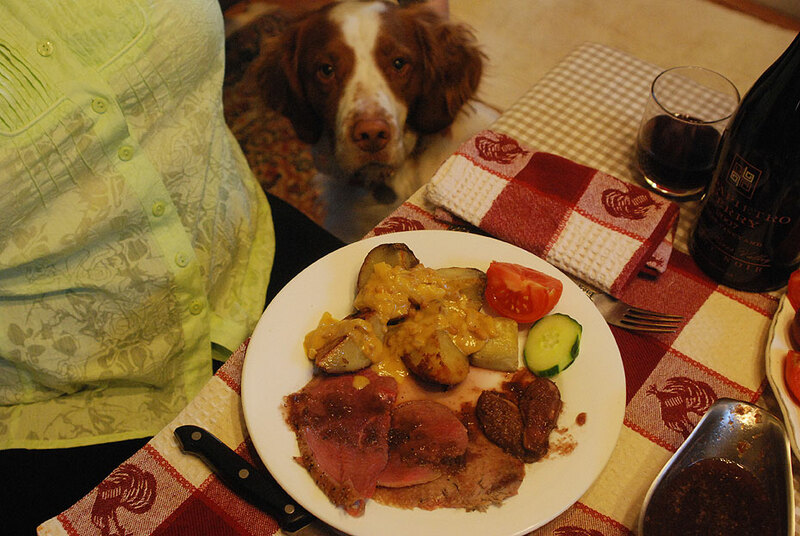 Two weeks ago, I had gone through the whole process of defrosting and brining the goose, but when the day came for cooking, I realized I didn’t have all the ingredients for the full dinner, nor the time—probably happened to you as you remembered a dinner or other meeting almost too late? Taking the goose in the pot that it had been sitting in to dry (I like to remove the brine for a day to let the skin dry in order to improve the browning and crisping of the skin), I put the whole thing in the meat freezer. 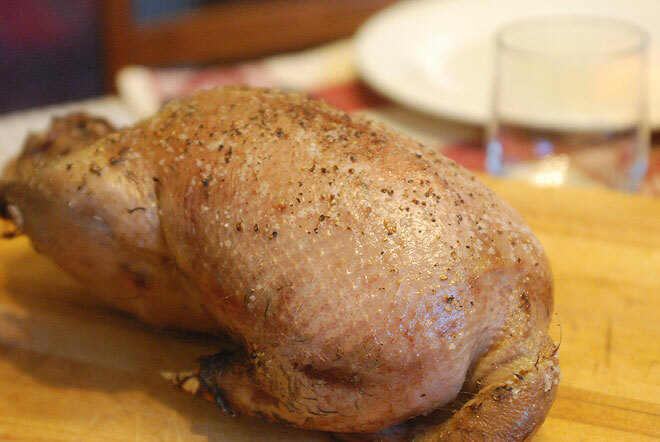 A week later, I had everything and the time….defrosting again, with trepidation: I was told that meat frozen and refrozen is just horrible….And when it was all done, the goose was delicious! Since the Fig Sauce takes the longest, make sure to prepare it first. 1. Finely chop six figs and add to a saucepan. 2. Save four figs and cut them lengthwise into sixths and set aside. 3. 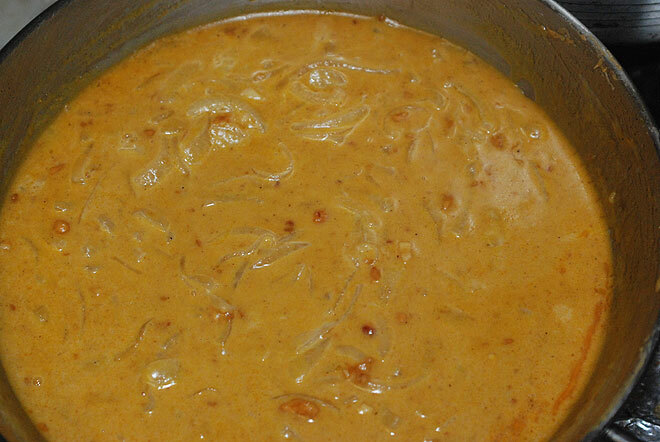 Add all ingredients and bring to a fast boil, thicking the sauce through evaporation—about 25 minutes on high heat. Sauce should be the consistency of thin jam. 4. Add the figs slices and simmer for another 10 minutes and set aside. 1. Brine the goose over night in a gallon of water with one cup each of sugar and kosher salt (use only ceramic or plastic containers so that there’s no reaction of the brine with metal). 3. Let is dry in the refrigerator for at least 6 hours. 4. Place the red onion in the cavity and rub the goose skin olive oil and then the salt and black pepper. Truss the legs or simply stick in the open cavity under the tail. 5. Place in a cast-iron skillet and place in an oven that has been preheated to 400-degree Fahrenheit. 6. Roast for 25-30 minutes at 400 degrees. 7. Remove and let rest for 10 minutes and then carve, serving with a two cooked fig slices and sauce. 8. Save the goose drippings and use to brown the potatoes. Cook goose like a great steak -- medium rare! Modified to use country roast potatoes instead of the traditional boiled, this family recipe has been served by mom ever since I can remember. An Ecuadorian recipe of Inca origins, it’s normally served with that other Incan delicacy, cuy (roast guinea pig). Wrap the potatoes in moistened paper towel and put them in the microwave for 6-7 minutes until soft to squeeze. Quarter them and dowse with olive oil. 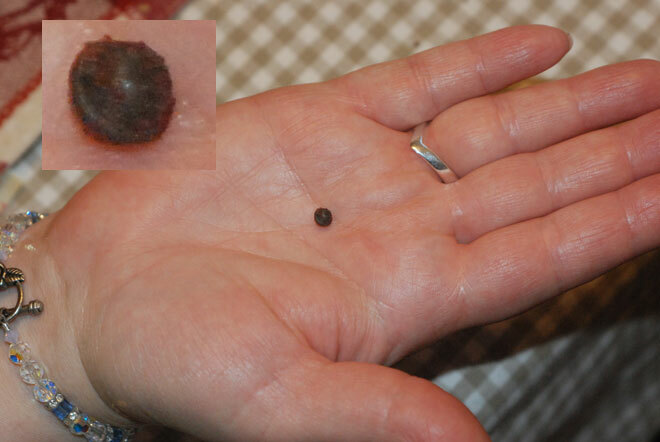 Fry the achiote seeds until the oil leeches out. Remove the seeds and then fry the onion in the red-tinted achiote oil until they’ve sweated and translucent. Add the milk, pinch of salt, and then disolve the peanut butter in the milk, stirring as it comes to a low boil. Don’t over cook the sauce. It should be creamy and the consistency of almost watery tooth paste, not peanut butter. Put the quartered potatoes in skillet previously used to roast the goose, uncovered, to brown in a 500 degree Faranheit oven, 10-15 minutes. NOTE: I used the Big Green Egg for the goose and the potatoes. Save the carcass to make a great soup! Where There be Ducks, There be Billy G! Imagine a 13-year-old in a new land, dreaming of doing what his father had done at his age. The teen arrived in the US after spending all his previous years in foreign countries and reading late-arriving Boy’s Life, Outdoor Life and Field & Streams, thinking that when he returned to the nation of his nationality, he’d get to experience what his father had been blessed with from the 1930s to the late 1940s. How wrong was that kid! California in the late 1970s was quickly on its way to becoming the most expensive state within which to reside. Land prices forced out family-run ranches and farms, forcing sales to foreign-owned corporations. In the process, a simple handshake and promise to leave each cattle gate as found (normally closed), perhaps a bit of the meat or fish from the day’s take to the landowner, no longer led to an automatic permission to hunt privately-owned land, i.e. most often the best land to hunt and fish in the United States. No, no, no. Instead, large club were formed to purchase hunting and fishing rights at thousands of dollars, something a young teen couldn’t even imagine of paying then. The only options were to hunt public national forests for deer, and bear, (pigs focus on free eats and safety on private land, so were never really an option unless you had access), and the waterfowl refuges. If my parents hadn’t stepped in to get a family membership with the now long gone American Sportsman’s Club (most of the properties went under the Golden Ram and Wilderness Unlimited domain), I probably would have spent years on public land getting skunked like so many neophyte hunters experience on public land. What was more important wasn’t the access to private land, but the education available from the much more experienced hunters and anglers on the membership roles, and, too, the hunting seminars. Billy Gianquinto conducted one of them. This is the man in 1977, who taught me to how to get ducks! There are some people in life that you meet who just have that charismatic quality about them that makes an impression on you. 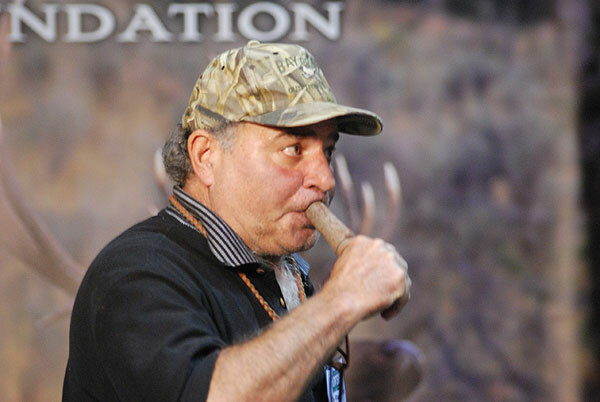 When it comes to duck hunting, the one who made the best impression on me was Billy Gianquinto. The next time I met Gianquinto after that instruction in 1977, was right after I had returned from hiding out and healing in Alaska to find that my old friend, Mark Eveslage, a cameraman well decorated with awards like the Emmy and just last year the Edward R. Murrow, was working on a new show, called the Charlie West’s Outdoor Gazette TV show. Better known for ducks, Gianquinto was their hunting host, and went off well with his own Billy and Buck waterfowl hunting show that I would enjoy regularly during the 1990s. Nowadays, Gianquinto and I both write and host for e4outdoors.com. And all this time, he never knew that I was one of those kids he taught way back, until just a few weeks ago. …That’s Billy Gianquinto’s gift: working with and teaching young hunters how to get their ducks—making sure the hunting line doesn’t die out with each succeeding generation. In all honesty, with all the “master” duck hunters I’ve interviewed and hunted with, my knowledge of duck hunting always ends up coming back to the tried and true teachings of Billy G.
With an initial knowledge of hunting built through reading and rereading classics like Hunting the Lawless and The Outlaw Gunner, and formed by great writers, many long dead, like Nash Buckingham, Ed Neal, and Walt Christensen, Billy G’s hunting history reaches back to when he was eight years old and saw a film starring matinee idol Errol Flynn, called “Robin Hood”. With a full costume like his favorite character and a bow, he ventured by bicycle to Golden Gate Park for the squirrels and pygmy rabbits hiding in the trees and brush. Soon, he went on a “real” hunt, a duck hunt with a boss at the Boy Scout camp he worked at during his youth. The article on that life forming event, shows exactly that mad, yet endearing, quality that duck hunters have over other hunters: who else actively anticipates the worst weather of winter and fall, and talks to themselves all the rest of the year with a duck call in their hands, and spends untold amounts of cash on the latest piece of waterfowl hunting equipment, and risks divorce just to get into a blind when the birds are in? Personally, my own waterfowl madness started with a friend from high school in Belmont, who pestered me to join him in the sucking San Francisco Bay mud flats and islands off Redwood Shores, right after I learned to call from Billy G. I can really relate to Billy G’s conversion to duckhood—with all its pain and self-questioning. There’s just something about seeing a bright greenhead cupped and floating down into your dekes, or my favorite, as I’m at heart a goose hunter, flagging a distant flock of Canada geese that break off the main flock and almost land on your head as you lay on your back in a dry barley or wheat field, waiting to make a clean headshot. 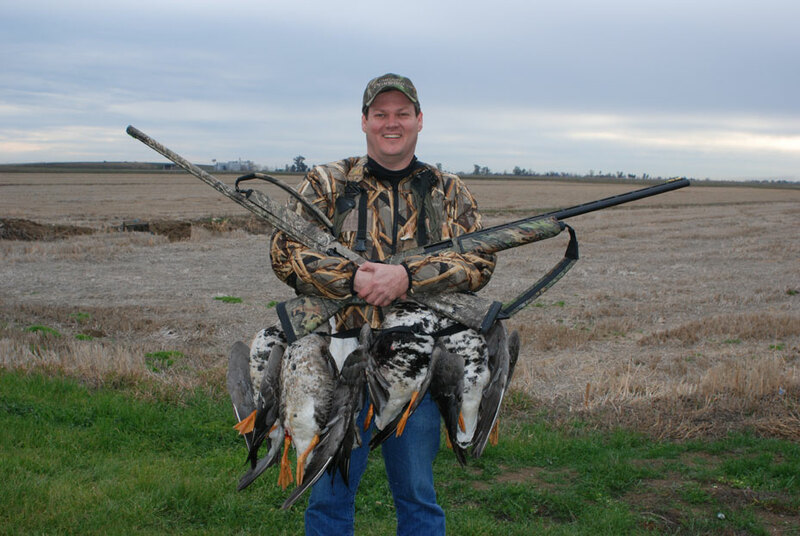 If you’d like to be converted to sitting in bad weather (though that can be a myth, too: many a mallard has fallen to guns on blue birds skies), and learn the tricks and tips that keep you from coming home cold and skunked, check out Billy G’s seminars at ISE Sacramento this weekend, and check out his website full of useful information and articles. And if you want to get a pintail whistle that will actually pull ducks away from others calling (it’s made of metal which is why it’s so loud), I can’t say enough good things about Billy G’s pintail whistle! The days of having a relative teach you how to hunt and fish are sadly going the way of the California condor. Thankfully, there are still shows in California and around the country that provide that education by experienced professionals. Waterfowl, big-game, trout, salmon, steelhead, and most of the equipment you need to actually go out and do it with are available for purchase and or trying out at shows like the International Sportsmen’s Show—no, the traditional name doesn’t just mean for men, as the quickest increasing population of hunters are women! 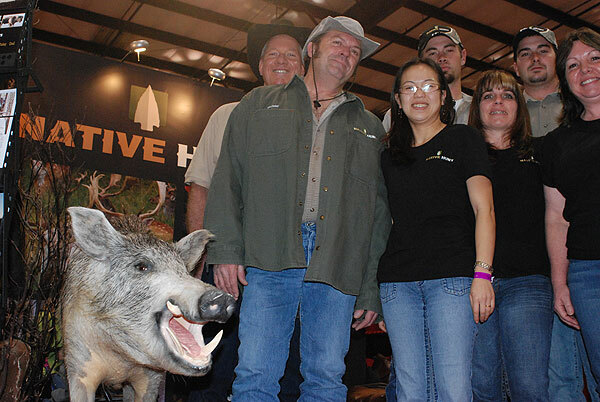 While chatting at our mutual friend, Michael Riddle’s Native Hunt booth; black cowboy hat-wearing, fellow pig fanatic of The Hog Blog, Phillip Loughlin, shared the same hope that these shows will keep the hunter’s torch blazing and lighting the way for new hunters to get hte right information and a solid opportunity to hunt private lands locked off from the public. Every year I wait to see what’s new and interesting and to see what new guiding operations are out there to provide the best bang for your buck experience: I’m always for a newbie hunter or angler signing up with a guide or outfitter for their first time, especially in an area that you might want to try on your own-why in the world would you want to spend more money reinventing the wheel, when overall, you can pay much less for a trip with a guide that takes care of all that time lost on trial and errors, so that you can be in the field as someone who is an important component of wildlife management and conservation? While the San Mateo ISE show is a week over, Sacramento is still raging well: where else can you get the opportunity to meet in person outfitters that can make your dream of hunting or fishing in lands of wonders, like New Zealand, Alaska and Africa?